For written exams, you will need to submit an application before the deadline (deadlines noted on our Training Calendar or on our exam web pages) with a notarized Proof of Citizenship form, and pay the fee to the correct agency. For online exams, contact Rural Water Association of Utah to register. Check our Become Certified page for complete details on the exam process, choosing a grade level, and to check exam dates. Can I take any exam and grade level or do I have to work my way up? The exams are not sequential and you can take any level desired. What courses can I take for CEU credit? All CEUs must be drinking water related. Wastewater CEUs do not apply but partial credit may be given if applicable and reviewed/approved by the Field Services Manager. Do CEUs apply to both my Distribution and Treatment certifications? Yes. CEUs will apply to all certifications and will only appear on your record during that 3-year cycle. What are some ways I can get CEUs? You can attend drinking water-related courses and online training. Check out our Continuing Education page for our Training Calendar and for some free online training. How do I get credit for my CEUs? The training provider will submit the course information and roster. Alternatively, you can submit an Individual CEU Application for credit and email it to DDWCEUs@utah.gov. The CEUs will appear on WaterLink’s Certification Report (in the Public tab). Where do I check my CEUs? You can view your current CEU status at WaterLink.utah.gov in the Certification Report (in the Public tab) and search by operator or water system. What if my CEUs aren’t showing on the Certification Report in WaterLink? WaterLink will only show CEUs for the current 3-year cycle. CEUs may not appear if you recently renewed your certification and are starting a new 3-year cycle. CEUs don’t start until January 1st after your certification exam. If you became certified this year, CEUs start next year. The CEUs may not have been entered yet, were not approved, or not submitted by the training provider. If you are missing CEU credit, please submit an Individual CEU Application or contact the Division. How do I know if my training will be approved for CEUs? All drinking water-related trainings are reviewed and approved by the Field Services Manager after the CEU application with roster is received. A letter of approval can be requested by the training provider before the training. Every three years. Your renewal cycle starts January 1st after you pass the certification exam. Meet the CEU requirement, submit a Renewal Application, and pay the renewal fee for each certificate (in Shopping Cart). How can I renew my certification online? Complete the Renewal Application and pay the fee in Shopping Cart. Not only will your certification expire but it could affect your water system’s IPS points. If you are the only operator that meets or exceeds the certification requirement for the water system, points will be added when your certification expires. Water systems are credited for having an operator with a certification that is above the requirement. How long do I have to renew or reinstate my certification? You can still renew up to 6 months, until June 30th, after the expiration date. Reinstatement begins on July 1st after the expiration date, the fee increases, and the reinstatement period ends on June 30th the following year. If a certification isn’t renewed or reinstated within 18 months, an exam is required to become certified again. What happens if I don’t accrue all of the required CEUs before my certification expires? CEUs can be accrued after the expiration date. However, any CEUs applied to a previous renewal cannot be applied to another renewal. How do I apply for Reciprocity? Fill out and return the Reciprocity Application to the Division of Drinking Water. Reciprocity is reviewed and approved by the Field Services Manager. If approved, a notarized Proof of Citizenship form and a $150 fee (pay in Shopping Cart) for each certificate is required. What does restricted and unrestricted status mean? A “restricted” certificate signifies that you have passed the exam, but lack the experience required by the Operator Certification Rules. Certain experience and education requirements need to be met to obtain an “unrestricted” certificate. If you do not meet these requirements, a “restricted” certificate will be issued. How do I apply for unrestricted status? Check to see if you meet the Minimum Qualifications. If you meet the Minimum Qualifications, complete and send the Unrestricted Status Application to the Division of Drinking Water. If approved, a new certificate will be mailed to you. 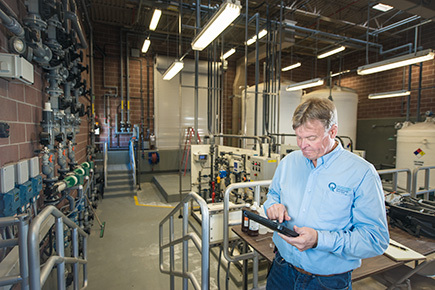 Can an operator be in charge of more than one water system? Yes. However, if there is a 24-hour shift, one operator per shift must be certified at the classification of the system operated. They need to be within one hour travel time to any of the water systems they operate.